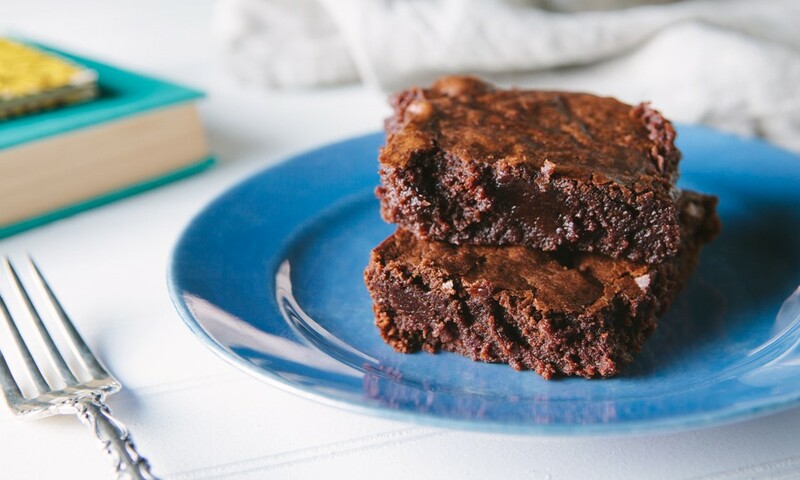 When we set out to determine the very best cannabis-infused brownie recipe, we wanted to include a truly classic recipe from a truly timeless chef. Julia Child’s brownie recipe is just that – a rich, gooey, chocolatey dream of a dessert. They’re called Best-Ever Brownies, but we think they don’t reach their true potential until the butter is subbed for cannabutter, as we’ve done here. Center a rack in the oven and preheat the oven to 350˚F. Sift the flour and salt together; set aside. Melt the cannabutter and chocolate together in a medium saucepan over low heat, stirring frequently and keeping a watchful eye on the pot to make certain the chocolate doesn’t scorch. (Alternatively, you can melt the ingredients in the top of a double boiler over, not touching, simmering water.) Add 1 cup of the sugar to the mixture and stir for half a minute, then remove the pan from the heat and stir in the vanilla. Pour the mixture into a large bowl. Put the remaining 1 cup sugar and the eggs into a bowl and mix or whisk by hand just to combine. Little by little, pour half of the sugar and eggs into the chocolate mixture, stirring gently but constantly with a rubber spatula so that the eggs don’t set from the heat. Fit the whisk attachment to the mixer and whip the remaining sugar and eggs until they are thick, pale, and doubled in volume, about 3 minutes. Using the rubber spatula, delicately fold the whipped eggs into the chocolate mixture. When the eggs are almost completely incorporated, gently fold in the dry ingredients. Pour and scrape the batter into an unbuttered 9” x 9” square pan. Bake the brownies for 22–26 minutes, during which time they will rise a little and the top will turn dark and dry. Cut into the center at about the 22-minute mark to see how the brownies are progressing: they’ll be perfect if they’re just barely set and still pretty gooey. (They’re still awfully good on the other side of set, so don’t worry if you miss the moment on your first try.) Cool the brownies in the pan on a rack before slicing and serving.